There's always room for Jell-O Molds! When discussing the times and how they've changed over the years, one thing is clear: There's good retro, and there's bad retro. Good retro is stuff like vintage dresses with nipped-in waist lines and swingy skirts. Perhaps a little cat eye eyeliner and a pin curl or two. That's good retro. Bad retro is the sort of stuff that deserves to be put into the vault of history and avoided from here on out, like cigarette smoking... and gelatin molds. What is it about the gelatin molds? As the images below will demonstrate, food has apparently come a loooong way since the mid-20th Century! Back in the 1950s, 60s and 70s, your average American housewife was seemingly trying her hardest to entomb entire three course meals in Jell-O, for some odd reason. They also ate a lot more parts of the animal than we do now, including organ meats and other (barf) goodies. They'd get creative with their commercial products, too; Spam was a perennial favorite, and it seems like they were pretty liberal with the mayonnaise usage, too. The resulting recipes are rather troubling to look at for those of us who like our food to look like, well, food. How bad can it be? You may ask. As it turns out; pretty bad. Take a look at 25 old fashioned recipes that your grandparents probably LOVED, but which make us feel just a tiny bit queasy. Let's start off with one that's not too bad. Ease you in gently, so to speak. Doesn't that look appetizing? Take a look at this jellied veal ring, also known as veal brawn. This is a dish that's eaten cold, directly from the old frigidaire. It's often served alongside some delicious boiled potatoes and pickled beets. According to Wikipedia, "the meat is cooked in salted water until it falls off the bone and then cut into fine pieces. The cut meat is then mixed with the stock and left to cool in a vessel until it is congealed." Yum! You had us at congealed, am I right?! Aspic is a savory jelly made with meat stock, and it was basically one of the food groups for home cooks in the 50s. Between aspic and gelatin, there was no shortage of gelatinous goo available in which you could suspend your family's dinner. So basically, this is a bunch of seafood goo on a plate. Our only question is do you use a fork or a spoon to eat it? A straw, perhaps? Here's the recipe, if you're into that sort of thing: Seafood Aspic. No, your eyes do not deceive you. This is bananas, covered in ham slices, drenched in hollandaise sauce. Now that you know what it is, could someone please explain to us WHY you'd ever make/eat this concoction. If you want to give it a try, knock yourself out: Here's the recipe. If you saw that Ham and Bananas Hollandaise recipe and thought to yourself, "What this dish is missing is some nice herring filets," then I hate to be the one to tell you that you are weird. It's okay, we still like you; but it's true. You're weird. Get some help. Some things never change, like good old Weight Watchers here. They make sure you lose weight by offering up such delectable recipes as this one: Liver Pate. Wonder what that extra creamy glaze on top is. On second thought, never mind -- we don't want to know! Don't worry, it doesn't just taste like a pile of poo... it looks like one too! This ridiculous blob of preservatives was apparently pretty popular among kids back in the day, and it even had another brief resurgence in 2017 when the recipe was rediscovered and went viral online. The dish consists of two cans of Spaghetti Os mixed with plain gelatin, then chilled in a round mold until firm. 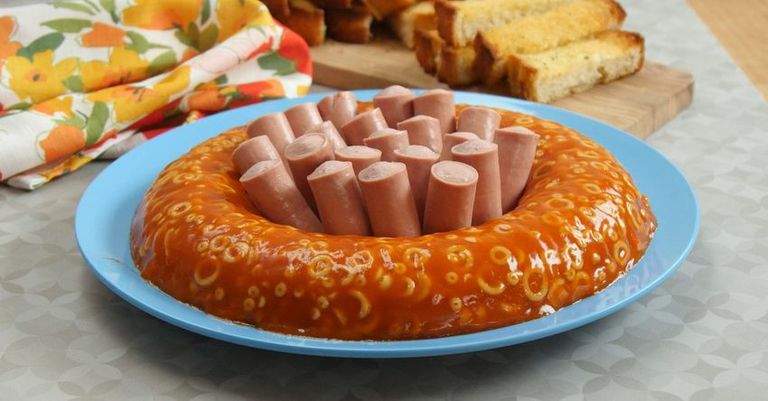 Finish this baby off with some Vienna sausages and you've got yourself a (nauseating) treat that your guests will love! Just kidding... no one wants this monstrosity to exist. NO ONE. Who among us hasn't looked at a cake and thought, "What this thing needs is more ranch dressing, cream cheese and Bologna?" You can make it yourself using this recipe, but no, we wouldn't care for a slice. No thank you. Meat from a pig's or calf's head that is cooked and pressed in a pot with jelly. Why just eat a pile of vegetables when you can put all of those vegetables into a Jell-O mold? Why? Because everything must go in Jell-O! Recipe here, if you dare. I don't care how it tastes, I do not want to eat anything that is smiling back at me from atop a plate. Want to make it? Knock yourself out. This dish makes us sad. It's just bland, beige food formed into a ring and topped with more bland, beige food. Maybe it's delicious, but come on. Ew. Hey kids, looking for a yummy ice pop on those hot summer days? Sure you are! Well get a load of this meat and ketchup popsicle. Wait, kids! Come back -- we were just kidding! Back in the 50s it apparently didn't count as a meal unless it was suspended in an oozing pile of gelatin. Also, are they serving it along with a side of raw scallions? Another Weight Watcher's creation that makes us all shake our heads and sigh. If this is what dieting entails, no thanks. We'd rather be fat. Also known as the Tower of Wieners. Just... no. The very thought of hot mushroom BBQ sauce hurts our feelings. What meat do they use for this recipe? Fancy Feast? Look what they did to a perfectly nice pork loin! They couldn't just serve spaghetti on the side. Oh no. They had to cover it with noodles so it looks like your dinner has worms. HARD PASS. Two words that absolutely should not ever go together: Salmon and Shortcake. Made with Cream of Celery soup, to boot. What a time to be alive! More cat food, this time covered in slivered almonds. Serve this bad boy up and watch your guests suddenly remember they left something in the car. Please keep your prunes away from my pork, thank you very much. How to ruin a perfectly good lobster, exhibit A. This recipe appeared in the Better Homes and Gardens Salad Book in 1958. As if it didn't look horrible enough, it was served with a side of mayonnaise and celery seed dressing for dipping. Yum? You leave our pancakes alone, you hear us! Leave our pancakes alone!!! We'll leave you with this yummy mayonnaise delight. It's got all the goodies in it: lemon, gelatin, olives and tuna. MMMM! Cut me off a slab!